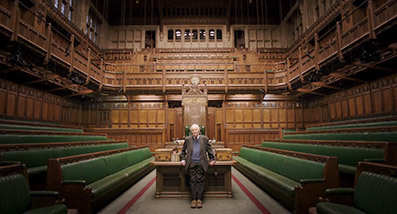 Slarek salutes TONY BENN: WILL AND TESTAMENT, Skip Kite's captivating documentary portrait of one of the most committed and respected figures of 20th century British politics, a film that became a worthy cinematic epitaph, recently released on UK DVD by Praslin Pictures. 'In the course of my life I have developed five little democratic questions. If you've never heard of Tony Benn then I'm guessing that you're either not remotely interested in politics (in which case you need to wake up and smell this particular brand of coffee, as it affects just about every aspect of your life) or you are young enough to be as yet become aware that there is a viable alternative to the greed and self-interest that dominates the political landscape today. 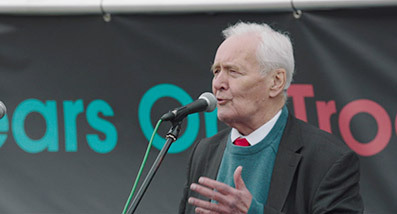 Tony Benn, formerly Anthony Wedgewood-Benn, remains to this day the longest serving of all Labour party politicians, a committed socialist who never compromised his convictions and remained a refreshing thorn in the side of the establishment elite for his entire political career. He was also a fiercely intelligent debater and a brilliant political diarist, and as an anti-war campaigner and supporter of workers' rights, he would participate in and speak at protest demonstrations, whichever government happened to be in power at the time. It was in this role that Mr. Benn helped to really wake this once young activist up to the deceptive and propagandist nature of the so-called popular press. Many years ago I took part in a protest march (one of many, I should point out) organised by the Campaign for Nuclear Disarmament, or CND as it was more widely referred to back then. The march itself was huge – as we set out, walking something like ten abreast, the line of participants snaked off into the distance, across the River Thames and down the far embankment seemingly off into infinity. It ended in Hyde Park (at least I think it was there – it's been a long time), where a number of speakers individually took to the podium to address the assembled protesters. Tony Benn was one of them. He was warmly greeted by the crowd, delivered a rousing speech, and was enthusiastically applauded as he left the stage. The following day, despite the scale of the protest and the terrifyingly large police presence, most of the tabloid newspapers simply ignored the whole event, presumably in an attempt to starve this popular protest of the oxygen of publicity. One of the few that did give it coverage was unsurprisingly damning of those who took part and did its best to convince us that even within our ranks there was hopeless disharmony (I've never seen people so joyously united). When Tony Benn took the stage, they assured their readers, he was booed so loudly by his audience that his words went unheard. I was genuinely dumbfounded. They hadn't just massaged the truth, they'd completely made the story up. We all knew the tabloids were propagandist rags for the political right, but this time the deception wasn't a matter for conjecture. I was there, and what I was reading bore absolutely no relation to what had happened. And they're still at it today, peddling lies and distortion in order to shape opinion and get their preferred candidates elected by those who still remain dangerously unaware that their beliefs have been shaped for them by the wealthy elite. The newspapers hated our Tony with a passion that would have probably brought lesser men to their knees, at one point even laying siege to his house and harassing his children as they left for school. His refusal to knuckle under to tabloid pressure saw him dubbed by that most odious of rags The Daily Mail as "the most dangerous man in Britain," a badge he wore with pride for the rest of his life. Indeed, in this very film he bemoans the idea that in his old age he is now referred to as "a national treasure" and is curiously reassured by the fact that he still gets the odd death threat. One shudders to think what he would make of the political landscape of Britain today: of a Labour leader so ineffectual and uncharismatic that even some of the party faithful cannot picture him as Prime Minster; of a government whose policies have left a million of the people they were elected to represent reliant on food banks for their survival; of a Secretary of State for Work and Pensions who despises the poor so vociferously that he'd comes across as a pantomime villain were he not so spitefully destructive; and of the rise of an über-right wing party whose popularity has been shaped by skilled image-makers and supported wholeheartedly by the tabloids, and is feeding and preying on xenophobic prejudice and looking to carve up everything fair and decent about the country and sell it off to the highest bidder. When Tony Benn retired, British politics lost its conscience and its last real voice of protest and reason. Where, one wonders, is his equivalent today? But stick with this and the romanticism quickly dissolves into a brisk montage of archive footage and condemnatory headlines that provide a stirring reminder of just who the film is about. We're then economically introduced to Tony Benn the family man before moving on to the details of his early life, the loss of his brother in World War 2, and how colonialism in South Africa and the atomic bombs dropped on Japan helped to steer him towards a lifelong career in politics. His time in office, in opposition and even waiting in the wings makes for a fascinating and intermittently inspiring social history class – that the post-war Labour government were able to launch the National Health Service and embark on an extensive building programme at a time when the country was technically bankrupt is a lesson in recent political deception in itself, and the fact that Benn still has the very first bottle of North Sea Oil brought ashore when he was Energy Secretary somehow delighted me for reasons I can't quite explain. His way of succinctly compressing events into a single sentence is at its best here when, after outlining how this oil revenue could be used for industrial development and that when he left office a quarter of the revenue belonged to the British people, he curtly observes, "When Mrs. Thatcher came to power she sold off the oil we had and used it to pay for redundancy pay for the people she'd sacked." 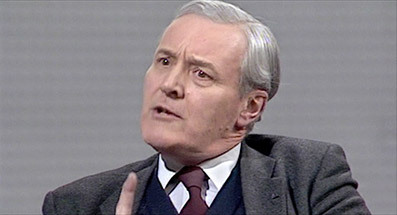 Much of the archive material is pure gold and showcases Benn the debater and political firebrand at his best, whether it be addressing the House of Commons and mocking the very idea of a Russian invasion, or berating an ITV newscaster for the station's biased reporting during the miners' strike. He makes a persuasive case for the abolition of the House of Lords, and as someone who fought to renounce his own inherited peerage in order to stand for parliament, he wittily scorns the very concept of hereditary peers – "If I go to the dentist and he begins drilling my teeth and he says 'I'm not a dentist myself but my father was a very good dentist', I think I'd pick somebody else." Indeed, the thing that really struck me about the film is how much of what Benn says is straight-up common sense, and the sort that would benefit the masses rather than those in positions of power and privilege. The film does at times play more like a cinematic self-portrait than a straight-up documentary profile, casting director Skip Kite in the role of facilitator and illustrator for Benn's words. 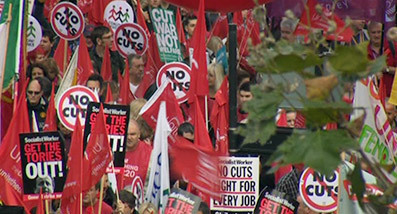 But Kite's work is still clearly visible in the film's thoughtful structure, in its sometimes impeccable editing (courtesy of Liza Ryan-Carter, who also cut Terence Davies' Of Time and the City and delivers a couple of dynamite, archive footage montages), in the inclusion of splendidly illustrative clips from the likes of Brassed Off (Benn's favourite film), Network and Glengarry Glen Ross, and in the film's own commitment to the political cause. The timing of the venture was to prove a little uncanny, with Benn fully cooperating in a cinematic trip through his life and achievements for a film that ended up being tragically true to its title (which I'm sure was chosen later in the production) when he passed away before its completion. Even the foreknowledge of this didn't adequately prepare me for the emotional kick that is delivered by the cut from Benn talking straight to camera about what he'd like to see on his tombstone ("Tony Benn – he encouraged us") to footage of his coffin being carried into church at his funeral. By this point the bond that has been formed between the audience and the warmly erudite Benn is considerable – we've got to know him on a personal level and respect him for his achievements, and the very idea that this eloquent, dedicated and supremely intelligent gentleman's life could come to an end within the narrative of the film feels strangely absurd and painfully unjust. If I were forced to find fault with this otherwise captivating tribute, it would be that it could have run for far longer without losing this particular audience member (on the commentary Kite reveals that the original cut ran for close to three hours), but this seems churlish given how concisely Benn's life and career are covered here. Yes, it feels a tad over-reverential at times, and I always get a little twitchy when 4:3 archive footage is cropped or stretched sideways to fill the widescreen frame, but in all other respects this is a most worthy tribute to a genuinely great statesman, and despite the brickbats hurled at him over the years by unelected media moguls and politicians of all parties, one who paradoxically remains one of the most respected. The disc sports a strong anamorphic 1.85:1 transfer, one whose crisp detail, solid colour rendition and well balanced contrast make a persuasive case for the DVD-only release. The archive material is also in fine shape, despite some minor stretching of the picture in places to fit the widescreen frame (don't do it, kids) – on the commentary director Skip Kite talks about the painstaking process of cleaning the material up, and the results speak for themselves. The Dolby 2.0 stereo soundtrack is impressively recorded and mixed, boasting a lovely clarity and range that peaks in the sound effects added to bring silent archive material to life, with the war time artillery in particular is thunderous enough to send a rattle through your chest. Benn's recollections are all cleanly reproduced, and even the archive news footage has been carefully mixed with the music (which always sounds great) to ensure that no detail is lost. An excellent job. Director Skip Kite and cinematographer Michael Miles get off to a slightly wobbly start when they suggest that talking over Benn's words is like treading on hallowed ground and express concern that we will want them to just shut up and let Tony speak. Erm, that's what the main audio track is for guys. There are some subsequent dead spots and some occasional verbal swooning, but the two still deliver the commentary goods and are infectiously passionate about their subject. Kite is open about his influences – the first shot is from Terence Davies, the set inspired by Dogville – and at one point even suggests it was Benn who directed the film (he's being modest here). That news that Benn wanted to be one of the crew from the day they started filming and kept them plied with tea throughout the production just adds to his allure, and my respect for actor Ned Beatty was further boosted by the news that he waived his fee for the use of the Network clip and asked only that he be given a copy of the finished film. The small digs at the current political status quo also prompted a few cheers. Director Kite's final interview with Benn includes archive material and cutaways and thus plays out like an extended scene from the film (indeed, some of it is in the film), and has been edited and mixed with the same level of care. 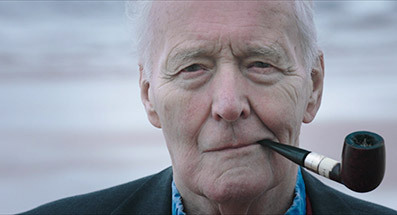 Areas covered include Benn's response to the hate campaign waged by the tabloid press and the price paid by his family for this notoriety, the influence of his late wife on his life and how he coped with her death, the idea that hope is the powerful force, his views on the afterlife, and his simple advice for young people today. Benn in goodwill Christian mode. The message is solid enough (be decent to each other), but I'm not the world's biggest religious teaching fan so tend to shift in my seat a bit during things like this. A Ken Burns effect-assisted trip through Benn's life and career via what we can presume is his personal photo collection. Rather captivating, as it happens. A solid enough sell, although the sound appears to be slightly out of sync with the picture on this one. With global politics shifting dangerously to the right, recent documentaries such as Still the Enemy Within and Will and Testament offer a timely reminder that there is an alternative to the greed and austerity politics that we have been falsely sold by the current gang of over-privileged political con men, who continue to assure us that this is the only option for recovery from a recession that was triggered by those who are still lining their pockets from its consequences. It also pays loving but deeply respectful tribute to a figure whose like is sadly hard to imagine even entering politics today, let alone holding office, one who stuck to his principles, stood by those he represented and refused to be beaten down by the unelected representatives of the yellow press, despite their unrelenting attempts at character assassination. The film is well represented by Praslin Pictures' DVD, which sports a strong transfer and soundtrack, and fair selection of decent extra features. Warmly recommended.